It is well know that in Catalonia we love rubbing or dipping foods (known as "xucar" in Empordà.) The most well-known of all is the popular art of rubbing tomato on bread (pa amb tomata), but we also dip melindros (a type of ladyfingers) or cookies or carquinyolis (similar to Italian biscotti) either in milk or Grenache wine, we dip neules (a long tubular pastry) into Cava, we poach peaches and pears in wine (rather than frying them) and dip xurros into chocolate. We must not forget that we all enjoy dipping bread in the olive oil of tomato salads or in the juice of beef with mushrooms! For Catalans dipping is the art of re-using leftovers, and we know quite a bit about being thrifty, don't you think? Dipping is part of our everyday lives. Rarely does a day pass without dipping something. But today we want to tell you about the oldest form of dipping that is now all but forgotten: BREAD WITH WINE AND SUGAR. In Catalan farmhouses there was always a round, country-style bread, which one could cut large slices from, and the bread could last up to a week. To make sure it didn't go to waste and to make it taste better, they would give it a generous splash of red wine so that it would get soaked and once softened, it would be topped-off with some suger. In some places quite a bit of sugar. Remember that in all these Catalan farmhouses there was always a porró type of wine pitcher around and there were children ready to eat sweets. Surely many who grew up in Catalonia remember eating this quite unorthodox treat when they were little, and those who are younger probably have heard about it at some point. -With bread and wine the road is made easier. Put the slices of bread on a plate and then pour read wine over them with a porró until they are fully soaked. Sprinkle on a bit of sugar and enjoy. 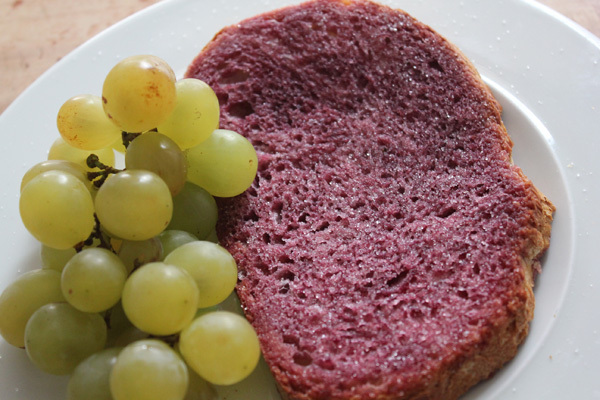 Bread with wine and sugar is part of the corpus of Catalan Culinary traditions.